Peace of mind for you, protection for your machine. Up to 5 total years of protection. Covers 100% of labor, parts, and parts shipping. We want to get you back to work as quickly and easily as possible by covering all defects in materials or workmanship. The best solution for you. Whether it's a new part or a trip to an authorized service center, we'll find the best solution for you and your Pressure Washer. *Extended warranties cover residential use only. Get Easy Financing with our Credit Partner, Synchrony Financial. On purchases of $299 or more with your DR Power (a Generac company)/Synchrony Financial credit card made between 1/1/19 and 7/1/19. A $50 promotion fee will be WAIVED. Equal monthly payments required for 12 months. *Offer applies only to single-receipt qualifying purchases. A $50 promo fee will be WAIVED. No monthly interest will be charged on promo purchase balance (including related promo fee), and fixed monthly payments are required equal to 8.33% of initial promo purchase amount until promo is paid in full. The fixed monthly payment will be rounded up to the next highest whole dollar and may be higher than the minimum payment that would be required if the purchase was a non-promotional purchase. Regular account terms apply to non-promotional purchases. For new accounts, purchase APR is 26.99%; minimum monthly interest charge is $2. Existing cardholders should see their credit card agreement for their applicable terms. Subject to credit approval. When you click the “APPLY ONLINE” button, you will leave our website and begin the application process with Synchrony Financial, our credit partner company. Fill out the form per the instructions. Your new card will arrive in the mail in approximately 7-10 days. We look forward to welcoming you as a customer! If you need help, please call us at 1-800-511-0658. Ultra-Fast. Easy to Use. Built to Last. The Generac SpeedWash™ 2900 PSI pressure washer delivers the raw cleaning power you need to accomplish the toughest cleaning tasks. The SpeedWash™ washer starts with a high quality Generac OHV engine and an aluminum axial cam pump–the heart of a pressure washer that delivers up to 2900 PSI and 2.4 GPM. Then we complement the core unit with innovative, user-friendly features that make using it fast and easy. Different cleaning jobs require different amounts of pressure. A common frustration with pressure washing is that you constantly have to stop to switch nozzles. That's why we came up with the PowerDial™ gun. It puts the ability to change settings, quickly and easily, right at your fingertips. Our high-pressure flex hose is soft, pliable, and easy to wrap. No more wrestling with hard, pinching hoses that are almost impossible to coil. When cleaning decks and driveways, it can be a challenge to maintain a steady distance and pressure as your arms tire over time. Our Power Broom houses four nozzles that roll along at a constant height. In addition to being MUCH less fatiguing, the Power Broom helps prevent accidental damage that can occur with a single high pressure nozzle. Plus, it gets the cleaning done up to 4X FASTER! Using a high-pressure rotating jet, the Turbo Nozzle can scrub away grime and stains quickly–cutting cleaning time by up to 30%. This handy nozzle shoots soap 3x farther and agitates it into an active foam. Each of the 4 application settings is marked with an intuitive pictogram: CAR, for autos and other light cleaning jobs; WOOD, for siding and other surfaces that require intermediate pressure; SIDEWALK, for pavements and other surfaces that can withstand full pressure; and SOAP, for applying detergent. The most flexible hose in the industry! Unlike PVC-coated hoses that are stiff and prone to kinking, Generac’s Flex Hose features a polyurethane cover that stays supple, even when pressurized, so you don’t have to wrestle with it. Non-marring and abrasion resistant. Easy-starting, horizontal-shaft (optimal for pressure washing) OHV engine provides plenty of power to drive the pump at full capacity. 50 state CARB approved. This high quality, long-lasting pump lets you easily make hose connections without having to kneel on the ground. Eliminates the need to tote detergent containers around with you as you wash. Holds a half gallon of detergent, more than enough for most cleaning jobs. Shipping Dimensions 24" x 20" x 22"
Tire Size 1.75" x 10"
I just got but used to clean my boat and rock patio and it an excellent job. There is just one small problem it is a little hard to start unless you make sure you relieve the pressure on the hose . Waited years to replace my old 2300 PSI washer. Glad I did. The 6882 car exceeds my expectations. I especially like the quick changing nozzles. After using the 6882 to clean my 32' motorhome, I decided to invest in the power broom, can't wait for the weather to warm up and clean the patios. Very satisfied. Driveway and wood fence are looking great. The air filter was soaked full of oil when it arrived. I had to contact customer service to get another one. It came promptly after making the call. The turbo nozzle that came with the unit did not work and was replaced after I called customer service. This machine works much better than my prior unit. I literally cleaned a concrete patio in half the time as before. The turbo nozzle and psi are simply awesome! I have owned four pressure washers and used several other over my 40 years of owning and maintaining my home and so far this General is the easiest and most flexible washer I have ever used. I would highly recommend the 2900 PSI Model 6882 to anyone looking for “The Perfect Pressure Washer. After Michael my place was splattered with dirt, sand, pine needles and bugs! We bought this to clean it up. Did a fantastic job on siding, sheds and decks! Super clean. Only negative is no lock on spray handle. So if you have children around be safe about that. Great in all other ways! Great machine. Was hesitant in making the purchase, but positive reviews and my research convinced me in making the purchase. Awesome machine! Great power. More than enough for my projects. Array of nozzles a plus. Pressure adjusting wand, a superb addition. Received speed wash 2900 in good condition. Assembly was easy. I was able to wash the house,driveway and truck with little effort.this product handles all of my needs for residential use. Excellent product. Quality Built. Operates smoothly. Good options of Pressure/Flow possibilities. Very solidly built. Starts easily. Kind of product expected from a quality and respected company. Very pleased with the power washer so far. Powerful and effective! I decided to buy a pressure washer but not sure which one. I watched many videos and read the reviews and I decided to buy the 2900 PSI and the 15 surface cleaner attachment. I bought it at the home depot and all I had to install was the handle and hose bracket. It was very easy. I cleaned my driveway, walkway and patio blocks. It looks like a professional did it. I am a disabled Marine veteran, and I am very pleased with it. Thank you. I found this product to be very useful as well as a quality product. It does the job without much effort and stays clean. I recommend it to anyone interested in purchasing a new pressure washer. Response from Generac SupportHello Bruce, thank you for taking the time to give us some feedback on your Pressure Washer. We're sorry to hear that it is not working correctly. We work with several local dealers and try to have a quick turnaround on any repairs that are needed. We understand that you placed the order with us because you needed this unit. Please have patience with us as we get it repaired and back to you. Great powerwasher did the job on my driveway. Better directions would be helpful on using soap dispenser. Not clear on how much detergent to use. It was easy to start and use. Needed it to clean my deck & fence. Job was completed quickly. Love this washer. I was very impressed with ease of putting it together. The adjustment features are amazing and i have enjoyed using it. I don't think i could have a better choice than this one. Was easy to assemble, started easy, worked great! What else can I say! Took some serious crud off of my camper! I’m very happy so far. I am very satisfied with this product. However the only disappointing feature is the size of the wheels. larger and wider wheels would make it much easier to push or pull over soft ground or stone landscaping which is what I have at my house at the shore. Best price. Great performance. Easy to use. Awesome accessories ie. second story nozzles!! I am overall happy wit the unit but the packaging left something to be desired. The tape on top and bottom was only wrapped up the sides of the box about two inches and had come loose. It was only held intact on the flat surfaces of the top and bottom. Also, I wish the specs had been more forthcoming about CARB compliant. I don’t need that and don’t think it’s necassery to comply with California. Great product,pricing, an customer service. High Quality equipment. I did some research, not a lot, but enough. I nearly bought a Stihl. Nearly got the Stanley. I was considering both for 7-10 days. Reviews were mixed and the Stihl was a bit pricey. Seen the Generac and thought they look GREAT. Read the reviews and it was a love fest! Then I seen the price. I feel like I stole the unit! I had 2 decks 8x16 that needed cleaned to restain. a 10x12 pool deck and a 32x60 home that needed cleaned off in a big way, it's been 2 years, maybe 3. Putting handles etc on a breeze. Put in the oil, gas, hooked up water, ran water thru hose, pulled the rope twice...I'm pressure washing! I changed oil as called for in the manual. As good a purchase as I have ever made! Hopefully one day I'll get a backup Generac generator for my home. Impressed! I like this product but the handle didn't have a washer inside the sprayer causing it to leak. THE GENERAC SPEEDWASH PRESSURE WASHER IS AN EXCELLENT PRODUCT. I PRESSURE WASHED OUR SIDING AND SIDEWALK. THE NOZZLES THAT COME WITH THE PRESSURE WASHER ARE BEST UTILIZED AS THEY ARE REQIRED. YOU CAN'T GO WRONG WITH A GENERAC PRESSURE WASHER. WORKS GREAT IN SOUTHWEST VIRGINIA! It is the best ive ever owned. Easy set up, controls and wand are awsome, one pull cold start, connections are easy to get to... I highly recommend this washer and brand to everyone. Put this together in minutes and it started first pull. Ran it on and off over the next few hours it always started with one or two pulls. Got it out a week later and same thing, started right up. Needless to say, I'm very pleased. Well packaged, no damage in shipping, and all parts were included. As for those dissing the flexibility of the hose, I personally think it's perfect for a pressure washer. In fact, it's very sturdy and much better than another washer I had. Only change I would want is a sturdier gun holder. I'm not fond of the plastic used. Packed well,easy to assemble and started on first pull. Did a great job cleaning my patio. Son used to clean RV with no problems. Great product. The oil was drained from the crankcase but not completely. The remaining oil leaked past the rings during shipping. This remaining oil fouled the plug and plugged the air filter after a 10 second run. Plug was a simple fix but it cost me another 50.00 to have the problem diagnosed. Once the air filter was changed it now runs fine. Got this for my husband. He is extremely happy with it. I even used it and found how simple it was to use. Great addition to our household. Purchased as an upgrade from a Greenworks 1700psi electric pressure washer. Assembly was very easy and quick. I was able to get it for around 350, with 2 extra attachments. Not only did it clean much better but was noticeably faster. Make sure to follow directions for first use, and it will be trouble free. The only complaint i had was when it was shipped, the box was turned wrong, breaking the piece that holds the nozzles had to use zip ties to fix it, then handle was bent, and looked as if oils had leaked out from somewhere. Overall great product, and looking forward to many years of service with it. Absolutely the best powerwasher period. I have had a few washers and this one is on another level. Power is unbelievable. Used once, has great cleaning power on my house and worked fine. Works great, put it to work the day it arrived. It does a good job,easy to start,plenty of pressure. The adjustable gun is really a benefit. Just wish I had waited 2 weeks and paid 314.00 instead of 349.00. But that is the way it goes. Cranked on first pull. Ran 1 whole tank and it did the job. Have used it afterwards with the same performance. Would buy another, but this will be all I'll ever need. Great tool! The unit has functioned without any problems. Instructions and assembly very complete and easy to set up. Users should follow instructions for best operating results. Very portable. Well balanced. With max. 50' supply hose and almost 30' of pressure hose, it provides required job reach. More than adequate for the average home owner. Packaged well. Delivered promptly from Generac. Nice pressure washer, only reason I gave it a 3 was it shipping with no nozzles, glade I got a free turbo waster with unit. And the nozzles are on the way. Works well, but why would you use Black plastic for the soap dispenser. You can't tell how much you have left, and on the 3200 model you can't empty the remaining soap, bad design there. I would hope that Genrac would offer a replacement dispenser to their current customers. got the power washer and it took a long time to get it going, the dials on the choke and gas are confusing, I was surprised it has no heater so you could have hot water to wash things with. great right out of the box and has never missed a beat in three weeks that I have had it. Could't be happier. Great power and starts on the first pull. I am glad I did not buy the 3200 model as this has plenty of power. Am pleased with this unit. Do have some issues with restarting after it sits awhile and I then try to restart it. And what am I missing with the trigger lock It locks it closed and I would think that it should be locked open so that the pressure would not be there when you are starting it. let me start by saying I only have 5 hours on this unit and I love everything about it from the ease of start too the design and attachments..Wow! The two free heads are the best.... you can’t go wrong with this one! I purchased this unit to replace a 20 year old Sears Craftsman 2400 psi. First time using it on my vinyl siding, rain gutters, decks, and concrete sidewalk. I was very pleased with how well it cleaned. Second time I used the 2 extra cleaning tools, first I washed my pickup, wasn't completely satisfied with the results. The I tried the swirling tip on my driveway, that tip did a good job. Overall the quality of the machine is very good, I would have preferred pneumatic tires in place of the hard plastic ones on this unit, and the soap tank could use a drain plug to empty it after use. Beyond that it appears to be a solid machine, I just hope it lasts as long as the one it replaced. This is my first pressure washer. I purchased the Generac based on the reviews. A great value simple to use and starts on the first pull. Assembly no brainer started 2nd pulls the rotary cleaning nozzle is a terrific option.the white gentle nozzle surprised me I power washed my screen windows with no damage. Package was in poor shape when delivered. Had to sign open box with UPS afraid parts where missing. After 34 years in the shipping business I instantly notice the taping was very poor. The I tapping method with well moistured brown gum paper fold ends over each side is the best. Put the washer to use on 4/28/18., started up with no problems. Liked the 35 ft. hose. My driveway now looks brand new and is doing a killer job on siding .Maybe a guard could be attached like a weed whacker option and lastly marks for the ears on the gas cap so will always know were they are goanna use a sharpie on mine. My research paid off thanks!! My wife loves things to be clean. We had been using the beast for too long when she decided we were going to treat ourselves to a new machine. She proceeded to do her research and decided on the GENERAC based on reviews, consumer reports and price. She is in love with me and her new pressure washer and our only regret is that we did not purchase sooner. I just used this pressure washer for the first time today. It worked great and cleaned my decks with ease. I would recommend this pressure washer!! Great product! It came ready to go in no time. Design is well thought out and functional. Powerful for most home projects. Highly recommend this washer. Great product, preformed better then I was expecting. I will spread the word to all my friends. You can spend well more than what this machine costs. Mode the money, this machine has done a good job for me so far. I've used it to clean lawn equipment like mower decks snow throwers. It has more than enough power to blast away the grass and grime. Very easy to start and stop. I received the unit direct shipped from Generac. According to the instructions there was to be a funnel included to assist in adding oil. No funnel received, and after a confusing conversation with customer service, I was promised an answer to my inquiry in several weeks. That has not occurred. It would also be helpful to specify exactly how much oil to add instead of to a fill point. I've only had the opportunity to use the unit once, and had a very hard time starting it. The choke did not seem to have any impact on starting the unit. After numerous pulls it finally started and ran very loudly. Again, this is only the first time using so I'm not sure if this is normal. Time will tell, and given what I've spent for this, I will not hesitate to return if it does not live up to its standard. Recieved my unit and put it together pretty easily. Followed instructions and went to crank and would not crank. Emailed customer service and still haven’t recieved a response. Anyways, I watched alot of YouTube videos on pressure washers to see what my problem could be. Most came with a throttle adjuster but not this one. I have to reach in and manipulate the throttle rod before I crank it everytime or it will not crank. Once you push it in it cranks every time. This should be fixed... Other than that I’m pleased but for that amount of money it should be flawless. I ordered this machine direct from factory based on online research and customer comments. It came in 5 days. It was easy to assemble and cranked on the second pull. I haven't had time to give it a full workout but it is as advertised and a quality built machine. Generac did a great job on the design and layout of this machine. Very easy to assemble out of the box and easy to use. I own and operate a demolition business, so I use the machine to clean my trucks, debris boxes and tractors. It works great, they knocked it out of the park with this unit. Ordered my Speedwash from Generac on a Thursday and it arrived the following Monday. The assembly was simple and minimal. We live in a 2-story house so I ordered the additional nozzles that reach out further with soap and water. Since receipt of the washer, I have used it for approximately 6 hours of run-time. It starts on the first pull and does an excellent job of cleaning mold, algae, and dirt from concrete, siding, and gutters. When cleaning my drive-way, gutters and siding, I used an all-purpose cleaner purchased from Home Depot. It reduces the effort to remove the dirt, algae, and mold. I am very pleased with my purchase and would recommend this pressure washer to others. The only negative criticism that I have is that I wish there was a low point drain for the soap container. However, that should not be a show stopper for anyone considering this pressure washer for purchase. I am sorry to say that your product came to me incomplete. The handle that holds the 4 color end tips was missing one of the rivets that holds the large orange plate on. I called support to get one of these rivets and they said they would send it out ASAP. They did, but it was not a rivet it was the plastic Christmas tree that holds the spray gun bracket. No help. I called again and they said that they would have to send a new handle because they could not find the part number for the rivet. Wasteful. I got the new handle, all four rivets included, but no decal, just a big orange plastic plate. New equipment, I wanted it to be perfect at the start. Maybe 3 or for years down the road I would not care, but when it is new, I care a lot. And to tell the truth, it could be 100 years old and I would still care. My first new gas powered pressure washer and my first dealing with Generac. I don't think I will have anymore. I was considering a home backup power system, I will look elsewhere! I would rate higher except for the following; 1. I have yet to receive a response to my email for support. 2. The unit has power to apply water to 2nd level, but it is not able to push detergent to 2nd level. 3. The detergent container while convenient does not have a drain option, and should be a see through, not black. Other than that the machine works fine. Packaging was easy to remove and Works well with all tips and very mobile. Price was fair. Air cleaner cover needs a spacer to prevent cracking cover by over tightening wing nut. I used a piece of the extra tubing from soap delivery tube.. Kill switch fell out immediately. The hose blew out before a tank of gas could be used. Not happy with this purchase or product service dept. I recently purchased power washer on line. This was very easy to do. The staff was very helpful in buying my power washer. It only took 3 days to get it. I used it for the first time last week and it performed like a dream. I would recommend this Power washer if you are going to spend the money to buy one. I would've given this product 5 stars, but when I received the pressure washer, the handle assembly didn't have holes for the pegs. I called Generac and they would send one out and it should arrive within 3-7 business days; well, that didn't happen. I called back and the customer service rep never entered in my order, but received one within 3 days. Great product after learning the different settings. Have used a couple of times. Really enjoy the pressure setting options. No regrets yet and do not for see any. Order #G00129950001. I made this purchase in May 2017, but did not have the opportunity to use it until Friday September 8, 2017. This pressure washer is great. It works extremely well. I plan to order additional accessories for it very soon. Thanks. An excellent machine,the right price,the right capabilities. Have used for over 10 hours with excellent results! It came fast and just as described, very easy to assemble and at a great price. I have only used it two times and am very pleased with it. Highly recommend this unit. Very easy to use and works great. I am glad I bought this model. I would recommend this to everyone. So far I have used this to clean my pool patio. Due to back problemseat I have not done this for several years. Works great. I used the 2900 to wash my house and it performed as expected, I have no complaints at all. I am extremely happy with the product. The only fault I can find is you do not have the low oil pressure sensor on this model, any chance that can be added? Since I have only used the system once I have not had the chance to try the attachments but I expect next spring I will. The delivery was rapid, and it arrived a day earlier than indicated. Assembly was Basically simple, but needs Further instructions on how to set up the Soap vacuum hose. Should it traverse over or under the engine? Instructions on how to attach the holder for the spray gun was also missing. The package included two plastic screws which appeared to be for attaching the holder, but they are too large for the holes. I will find some screws that will fit at the hardware store. I used it for the first time Today, washing my car and the outside of my house. It worked well without any problems, therefore, the five stars. used it once for 2 hours.worked very well.very good so far it did what i hoped it would do. I Love This Pressure Washer! I've had 2 Kenmore pressure washers and none of them could stand up to this "Beast." You can definitely get a pressure washer for a cheaper price, but this machine is well-worth its cost. I haven't had ANY problems with it and it starts on the first try. It's not too big and I love its design. The power it puts out is very impressive and it cleans like a champ! I ordered the longer (32") wand and it saves a lot of stress on my already bad back. I highly recommend this pressure washer! So far so good! Product works as advertised ! I am very dissatisfied with this machine. This is the forth power washer that I have owned. I replaced my existing machine with a new one every seven or eight years. This has several fundamental flaws: Engine – This engine is very hard to start and vibrates severely while running. Muffler/Heat Shield – This area of the unit gets very hot and the heat shield does not safely protect the user or other for serious burns. The embossed warning is inadequate and hardly visible to warn others nearby. Rust is already appearing on screws and nuts. Apparently stainless hardware was not used. The spray handle is a nice improvement over conventional designs although variable pressure knob does not add much value. The soap pickup using the soap attachment does not always work. There is no complete and detailed diagram of the pump assembly in all of the documentation. I used the pressure washer for the first time August 5 2017 . The pressure wash worked great except that when I went to shut off the unit the on/off switch came out of its mounting hole and had to improvise a way to shut the unit off. I am hoping that the company stands behind their product and send me the parts needed to repair this issue. The on/ off switch is a very bad design. In this day and age the use of old fashion designs do not work. Just began to use it and it worked flawlessly when cleaning truck. The power washer was easy to assemble and started after just a few pulls . I used it to clean our wood deck and our large concrete driveway . Very happy with our results . The main hoes is easy to connect to both the handle and machine . My one complaint is there's no good way to run the plastic hose to the soap container . My hose moved and touched the hot engine which melted it . Yes I would recommend this product . This machine worked really well for its output rating and cost! I USED MY PRESSURE WASHER FOR THE FIRST TIME THIS PAST WEEKEND. I AM REALLY IMPRESSED. IT WORKS GREAT. IF I HAD TO SAY SOMETHING NEGATIVE IS THE LOCATION OF THE PULL CORD. OTHER THAN THAT I WOULD RECOMMEND IT . Used this unit to wash my house, modular on the lake and my boat. Itll take the loose paint off concrete steps or be gentle enough to clean vinyl siding. Its loud when it runs but havent found one that isnt. Have used 3 out of 4 tips and havent washed the car yet. This little guy does it all from what I can tell. great for power washing around the home. easy to use and plenty of pressure. Right out of the box, it started and ran like it should. First night I cleaned a 6 car driveway with it. Plenty of power for anything you'd need it for. The turbo nozzle is a must have. Cons - hose not flexible enough. Handle holder on unit doesn't seem strong enough but have had no problems with it yet. Very nice power washer for the price. It starts on one pull every time. This is a great machine, I love the switch on the handle that lets me choose between car, soap, concrete, and wood. It really makes it easy to wash cars/atvs/motorcycles etc. I don't have to worry about blowing the paint off my car if I left it turned up from last time. Starts easy, runs great, and makes short work of the cleaning jobs that I use it for. This is a great machine and I would buy another one in a minute. Plus it's made in America!! Received my pressure washer and put the adjoining pieces together and used it to do my back porch. The power is great for what i need and it cleans so well. This unit met every expectation. Unboxed it, added oil and gas, hooked up the water and put it through a thorough break-in by washing the house, 10x16 elevated dack, 8x10 rear deck, and a treated lumber playset with slide and rock-climbing wall. It performed perfectly and started with one pull everytime. Great product at a reasonable price point. Easy to get up and going, however, soap would not siphon because o ring was broken and couldn't get any customer service from Generac. Called and got disconnected. Ordered a replacement siphon unit and the unit still does not pick up the soap. Other than soap issue the machine is fine. My first purchase was the black max power washer with the Honda engine. It was stolen from my garage so I decided to get another one just like it. I saw a add on TV for the Generac Speedwash before I had made my purchase. I have a friend that has a Generac Power Generator and that thing is some kind of powerful. The Speedwash was about $200 cheaper and had 2900 psi vs 2700 psi I decided to give the Speedwash a try. I could not be happier with my purchase. Easy to start, more power, larger gas tank, and the ability to change what you want to clean is on the wand makes it hands down a better machine. Also it has a great warranty. I have used my washer several times and I am completely satisfied with it.. Very easy to operate. Worked really well. Only suggestion would be to add a drainage plug at bottom of soap tank o make it easier to flush out. Pressure washer works fine but 30'of hose is not enough to complete a job. I had to buy another 50' of hose and connect it to the 30' just to do my driveway. Machine seems to be made well with the exception of the holder for the gun......cheap plastic which could be improved. Works as advertised. Still waiting on the 2nd story nozzels. I purchased this mainly for my deck and vinyl siding. My deck was is fair shape and has not been stained or sealed in a long time. There was a fair amount of mildew and graying which has all but been eliminated. It started easily enough and performed in most areas very well. If I had to critique anything it would be the wand. I think the spring tension of the trigger is too strong as your hand gets tired of holding it in the open position. The wand is fine for shorter people but not for me. I know there is a longer one available which I will purchase but it could be included in the package. So far this is a very good buy, I will update later after I use it more on my siding. So far this has been the best. I have used it a lot so far. I hope it keeps going, because I love it. I would this recommend this product to anyone. I've used my new SPEEDWASH twice now, and it has performed flawlessly! Easy assembly right out of the box, easy to start and plenty of pressure. The company takes great pride in attention to detail, very well thought out product! I HAVE recommended this to my friends. I have used this pressure washer to clean . a large brick patio area. I had an electric washer to perform this task. The Speedwasher lives up to it's name taking about 1/3 the time vs. the electric washer which is rated at 2100 PSI. Will be utilizing the washer on several more projects this summer and will amend this review if need be. Very good product. Price was right and service great. Would buy again. this washer is everything i'd hoped for.starts easy,loads of pressure,not too heavy.cleaned my driveway and sidewalks with just water,the one cleaning tool you included is amazing. Bottom line, I cannot rate how good or bad it is till I have used it for a year or so. Unit came packed well, in good shape. Line for soap could be given some holding clips to keep it away from the engine and off the ground. Very simple to assemble so anyone can do it that can read or has any very basic logic skills. This unit replaced a 10+ yr old Craftsman unit which was stolen. Man, what a change in the quality over what was available 10 yrs ago! Appears to be a very high quality unit. Would have liked to see a drain plug on the soap tank though. I was very pleased with the power and ease of use of this machine. It has plenty of power for most jobs yet with the adjustment on the wand your able to use it for smaller application that do not require all the power. Very nice machine. I am confused as to how to rate this product. I am not new to Generac, power washers, however this has not been a good experience for me. When I got the product I assembled it and when I went to try it out the water shot back at my face I talk to customer service about the issue we had a hard time verifying the product model and serial number I still don't know where we're at with this, we communicated by email, I talk to a representative named Jenny, she didn't get back to me as to where the last numbers I gave her were the correct numbers or not. I also talk to her about needing another Lance being that the one that was sent with the product was not put together the right way and that's why it shot the water back at me. I still haven't heard back from her or the company regarding this problem. I use the lance off the old machine. The power washer works good but I have had very bad results with customer service. Having said that I had to rate it in the middle at three stars. Again I bought this product because I know generac makes good products but I am dissatisfied with customer service. We bought this product because we've had good experience with our Generac 22kW Generator. We've used it three times to wash our house, our decks, and our cars. Overall, we are happy with this, but there are a few design issues we would fix. The tube into the fluid chamber is too short and the tips will fly off under pressure - doesn't matter which one you are using. (So, just be sure not to point it at anyone while in use!) On the whole, it is much better than the one we had, worked well when the tips stay on, and we are happy with the purchase. Overall very happy. There is a design flaw with the bottom front rubber cushion. This has come off. I will be contacting generac for a replacement. I bought this about a month ago and used the heck out of it. I also bought the brush unit. The option is good for light duty sweeping, but not for heavy cleaning. The turbo nozzle does a great job for that. Have used three other competitors and by far this has beat them all. Would recommend this product. Shipped to my front door and the assembly was a breeze. Took less than 10 minutes. Comes without oil in the engine, but they provide the oil in a convenient container in the box. Fired right up and I had instant high pressure power. I was a little worried about the bright orange, but I love it when I see it in my garage. Go bold or go home. I could not be happier! The Generac Speedwash Pressure Washer performed as expected doing a great job in cleaning my deck and siding. One issue I encountered was the choke. Once the unit was hot, the choke should be moved to the open position - per the manual. However doing so made the unit run rough and potentially stall. I have to move it to a partially open position for the unit to run smooth. The rotating head is the best part - no deck gouging. Worked well, oil drain design a pain, hard to find model and serial numbers on washer. Would recommend. I'm very happy with my new pressure washer it works great. I would buy this again I'm very pleased with it thank you. I love the selectable power flow in the handle. Did the driveway and the roller multi-head sprayed. Excellent unit. Start with one pull of the cord. I have used the machine to clean patio and driveway and it did a tremendous job. I have also used it to wash the cars. It works great and is easy to use. The power washer was very easy to put together,great power and it was easy to start. I'm very happy with this product. I decided to investigate this Generac washer because of previous use of Generac product (Whole house power generator). This power washer meets all my needs as a homeowner. after a couple hours of use i can say its simple to set up and use and performs well, shipping was fast and packaged well. flex hose was a nice extra and 30 ft. If you want fast professional cleaning results, the SpeedWash system is your best bet! We are very excited to introduce our new line of SpeedWash pressure washers! What makes this new line so great is the system of innovative cleaning attachments that are included. The power broom attachment is so much easier and faster than using a standard nozzle tip. It cleans using 4 high-pressure nozzles and rolls easily over your deck or other surface. The turbo nozzle attachment is a must for removing stains on harder surfaces. It produces a powerful pinpoint stream that rotates like a tornado and cleans much faster than a standard nozzle tip. The Powerdial gun is a true innovation…It really makes pressure washing a simple task. All you need to do is match the icons on the Powerdial gun to what you are cleaning and you have the optimal cleaning power for that task. The concrete setting delivers the most intense cleaning power but you can dial it down on the fly to the car setting for delicate cleaning power. This greatly reduces damage to softer surfaces. Finally, the premium flex hose that comes with SpeedWash is a huge step up from the standard black PVC hose. It’s much more flexible making it so much easier to maneuver and coil up when you’re finished cleaning. The flex hose is 30 feet long so you get an optimal cleaning radius. If you want fast professional cleaning results, the SpeedWash system is your best bet! 24 people found this review helpful. Q.Are there limitations on the length of supply (garden) hose used? A.Yes, the maximum length of supply hose is 50’. Using a longer hose can lower the amount of water available to the pump due to how far the water needs to travel from the source. There can be periods of time where the pump is running dry, causing damage to the pump that is not covered by the warranty. 103 people found this answer helpful. Q.How do I select the right power washer? A.The first question you should ask yourself is where you intend to use the power washer - at home or at work. A power washer used primarily at home probably doesn’t need to be as powerful as one that is used on a job site. Around the house, for example, you shouldn’t need more than 3200 PSI. To be fully productive on the job site, though, you probably need at least 3200 PSI. Next, ask what you want to clean. If you’re looking to simply take the dirt and grime off the driveway or patio furniture, you can use a unit with a relatively low pressure, perhaps 2500 PSI. If, however, you plan on scrubbing mold and mildew off concrete, or prepping a house for painting, you should consider a unit with a higher pressure like the 3200 Speed Wash. Finally, think about how much cleaning you will be doing. If you’re cleaning a number of items, or if you need to clean a large area, you might want to consider a unit with a higher GPM. More water means more cleaning power, and a higher GPM will make the job go faster. Cleaning attachments such as the Generac surface cleaner, power broom, and turbo nozzle can increase cleaning speed by up to 4x faster than using a standard nozzle. 69 people found this answer helpful. A.Thank you for your interest in the Generac 2900 PSI Speed Wash Pressure Washer. This unit does have a fuel shutoff valve. The handle measures 18 inches with a 20-inch lance. There is an optional 32-inch lance available. Please feel free to contact us if you have any other questions. 49 people found this answer helpful. A.Thank you for your interest in the Generac Speedwash Pressure Washer. This unit comes standard with The PowerDial Gun. The lance on the PowerDial Gun is 20". There is an optional 32" Lance available, giving you an extra 12" reach. Here is the link: http://www.drpower.com/power-equipment/pressure-washers-water-pumps/accessories/generac-32in-lance.axd Please feel free to contact us if you have any other questions. 47 people found this answer helpful. Q.Could you tell me what kind of soap is recommended for your pressure washers? I don't know if it takes a concentrated product that mixes with the water as it is sprayed or something else. Thanks. A.Thank you for your interest in the SpeedWash Pressure Washer. In accordance with the manual, you are able to use any detergent that is labeled "pressure washer safe". This should be marked clearly on the label. Please feel free to give us a call if you have any other questions at 1-800-687-6575. 45 people found this answer helpful. Q.What is the difference between PSI and GPM? What should I be looking for? A.PSI measures how much force the power washer is spraying. GPM measures the amount of flow the power washer deliver behind that PSI force. Think of PSI as “what can I clean” and think of GPM as “how fast can I clean it”. 35 people found this answer helpful. Q.Who is the engine manufacturer? A.Thank you for contacting us. 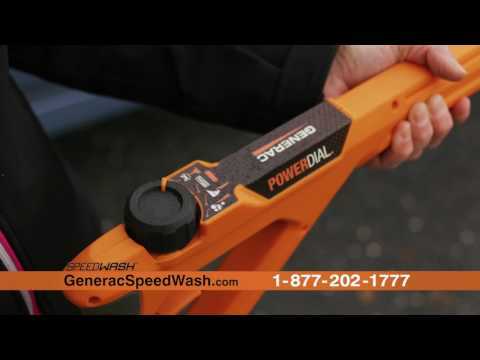 Generac manufactures the engines for the Speedwash Pressure Washer. Please feel free to contact us if you have any other questions. 28 people found this answer helpful. A.Thank you for contacting us. The PowerDial Gun is not sold separately, it is only available on the Speed Wash Units. Please feel free to contact us if you have any other questions. 16 people found this answer helpful. Q.what diameter garden hose would be best to use for this washer? A.Thank you for your question. You will want to use a standard garden hose, 5/8". Please let us know if you have any other questions. 13 people found this answer helpful. Q.What do PSI “Max” and GPM “Max” mean? A.A “max/min” rating means that the max PSI is set using one nozzle and the max GPM is set using another. The nozzles used are noted on the top of the box. This is the standard PWMA rating method. Some competitors use the CETA rating method which requires that both measurements are taken with the same nozzle. 10 people found this answer helpful. Q.Does this have a throttle control / variable speed throttle, or is it one, constant engine speed all the time? Thank you. A.Thank you for your question. The Speed Wash Pressure Washer has a fixed speed throttle control. Feel free to contact if you have any other question. 5 people found this answer helpful. We will ship to a depot near you for FREE. Click on the SHIPPING tab below for details. © 2019 All rights reserved. Country Home Products is a subsidiary of Generac Power Systems, Inc.